The new and improved Great Aussie Waffle Log 2.0 recreates an iconic chocolate bar from the past. A crispy wafer roll filled with creamy marshmallow and coated in milk chocolate. Receipt time will be approximately 1-2 weeks depending on your shipping location. This is a wholesale box of 72 units for resellers/retail outlets only. Note: These are a hand made product - weight may vary between 50-60 grams. The Great Aussie Waffle Log recreates an iconic chocolate bar from the past. 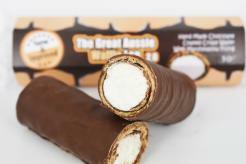 A crispy wafer roll filled with creamy marshmallow and coated in milk chocolate. Note: These are a hand made product - weight may vary between 70 - 90 grams.